For days, I check on several friends each time I hop on social media. I have been watching to see how they are in dealing with Hurricane Harvey bearing down on them. First concerns are for the people, but I can’t help looking to see how the farms are doing. Hurricanes have ripped through friends’ crops too many times, I’ve seen farmers prepare for hurricanes and deal with the aftermath. When a friend sent me a message asking me questions about cotton in Harvey, I decided to talk with my dear friends Kelly and Jon Whatley who grow cotton, milo and more in South Texas. They have already faced what we hope is the worst of it in their area, so took a bit of time to help me understand how it is going. First, I am glad to have seen you posting that you are all fine. Can you tell me what the storm was like in its height where you are? What’s it like today? Very noisy. Landfall was at night, so we couldn’t see what was flying around or how bad it looked. We are in the middle of a field with no protection, but that also means no neighbor’ debris flying around either. Saturday morning, we woke up to water standing in the yard and lots of limbs down, tree and plant debris. We had power Friday night until around 8:00 PM. Luckily we have a generator that runs off a tractor’s PTO shaft so we have had electricity. What you have heard from friends and family along the coast? What’s it like for them? Yes. Some total devastation other very little damage. One friend (Hannah Miller) lost contact with her family near Rockport in the height of the storm but ended up locating them after some scary hours of not knowing. Her family’s home and farms are terribly damaged but her family is safe. Friends in Aransas Pass and Rockport will be assessing the damage and working to clean up/repair for a long time. Any estimates on how long it will take to get power back and other services, etc? Some people are getting power back now. Officials are saying it could be up to 10 days for some areas. Our house is the very end of our line. I am afraid we may be the very last to get electricity back. Most water districts are on a boil notice if they even have water. Electricity for the pumps to fill the water towers still hasn’t been restored. We have never lost water. I would have told you we were looking at a fantastic crop with historical cotton high yields. It was the best cotton crop of our 24 crops. Spirits were high in the South Texas farming community. Where are you now? Modules in the field? Some of the crop ginned? All of our crops are totally harvested. There was cotton sitting on every spot on all the gin yards in the Coastal Bend. 50% of our cotton had been ginned. Rest at gin yard or fields. The ginners try to store the unginned modules on pads or higher ground, but when it comes to a hurricane, all bets are off. The tarps help protect the cotton some, but many tarps blew off. 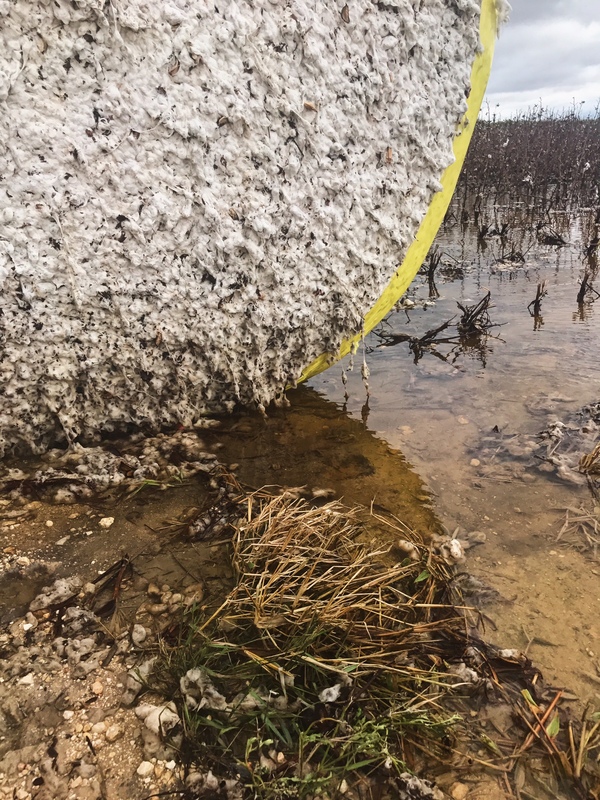 The round bales/modules are better protected since they cover more cotton surface. Here are some of the photos Kelly’s taken (remember she’s on my list of top farm Instagrammers for a reason). I’ll try to explain what we are looking at. This first one is a shot of modules (some round and some rectangular, some call the round ones round bales) waiting to go to the gin. You can see some of them are sitting in standing water. What about other crops? Neighbors up the coast? Other crops harvested here. Up the coast, early news is devastation for unharvested crops. Reports of gins closer to the coast heavily damaged with modules blown away. I’ve heard conflicting information on crop insurance, can you tell us what you have found out? Crop insurance covers historical value, not value in the field. This was a banner crop and the insurance levels does not meet banner yield levels. There are huge deductibles, and we are not to the point to know details yet. Crop insurance is not very helpful at this late stage. We don’t know how it will all shake out since we’ve never been in this situation. What happens next for the farms in that area? First we have to dry out & assess the damage. We found some trees that took out fence sections at the ranch, so we will get to fixing those first to keep the cattle contained. We are used to waiting on Mother Nature, and will have to wait for the rain to stop. How will the farmers in Texas deal with all those wet modules? How will they dispose of them? Again, the waiting game. Have to let the modules dry out. Then assess if the cotton is ginnable or not. One of the problems with agriculture – nothing is immediate. We have to wait for nature. The cleanup everywhere else may be over but the gins and farmers will just be getting to the point to make decisions. Even if the cotton is ginnable, the quality is much lower. Cotton is graded on quality, so the grades will take a hit. In turn, the farmer will get less money for his cotton. More photos to share and understand what they are looking at from being ginnable, maintaining quality, etc. Some of the problems are similar to dealing with rain at harvest time because with all the water and warm temperatures, some of the seed that is still sitting in the module may start to sprout. Jon’s finger is pointing to a root that has emerged from a seed and if you look closely you can see several more. That really is difficult on a gin that is designed dry cotton lint and cotton seed. This photo shows how incredibly bad the wind has been. The field that you are looking at had been picked. Winds from Harvey beat up the rectangular modules so much, it seems to have twisted the fiber back onto the plants! I couldn’t have imagined…. But this photo is even more illustrative of the point the Whatleys made… the round bales / modules definitely held together in the wind better. You can see that the plants in that section of the field are showing up as dark swaths. Wow. Thoughts will stay with them for the coming future… Kelly said they may have some drone footage to share soon, but for now, there is more work to do. Sending you guys good thoughts for a speedy recovery! This is fascinating and sad. Prayers for you and Texas. Mother Nature is definitely a force to be reckoned with! Wow, seeing all this cotton brings back many memories of stories that my grandparents told me from the past….glad your friends are okay. Wow, Mother Nature is definitely a force to be reckon with. Seeing these fields of cotton reminds me of the stories that my grandparents would tell…glad your friends are okay. Heartbreaking!! Truly! This is similar to what happened to us in the devastating floods in SC 2 years ago. The land itself has not yet fully recovered. Earnest prayers for all the agriculturists affected.